Blu-ray SteelBooks are too often limited edition collectibles. Due to bad timing, I fear that this post should be read for informational purposes only. 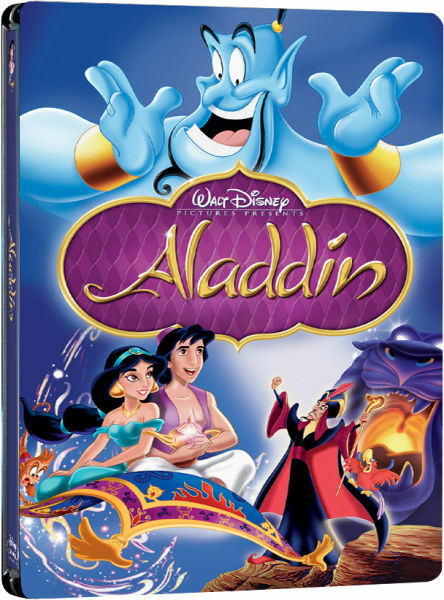 If you didn’t already place an order for the UK exclusive SteelBook release of Disney’s ‘Aladdin’, you may have missed the too-brief window. Despite being a huge hit back in 1992, ‘Aladdin’ seems to have fallen out of favor with the powers-that-be at Disney. I guess the DVD release didn’t sell as well as expected. Since then, the studio has demoted the title out of the Diamond Collection, and has made no indication at all of a Blu-ray release in the United States. However, with little fanfare, the movie was released on Blu-ray in Europe this year. Aaron recently reviewed a Dutch import copy. A comparable edition also became available in the UK this week. It looks pretty good. The artwork isn’t anywhere near as classy as the old Japanese Laserdisc box set, but it’s decent enough. I was fortunate enough to put a preorder in while the listing was still active. I apologize for not posting this in time to give anyone else a heads-up to do the same. This will no doubt be frustrating for a lot of people, especially for Disney collectors. Disney had a good run of releasing a lot of its animated movies in SteelBook or equivalent metal case formats, but stopped recently, allegedly after Metal Box manufacturer Viva was sued by Scanavo, the company behind the SteelBook brand. New Disney metal cases are few and far between. When one like this shows up, it should be an exciting event. Why would something so popular be artificially limited. I would buy some of these if it wasn’t so stupidly frustrating that they obviously dont want my money. Same thing with Limited Collectors Audio CD’s, Really? because you dont have the bandwidth to put a lossless copy online and sell tons of copies? This bums me out. Aladdin is one of my favorites and I have been hoping for a treatment like The Little Mermaid is getting. If you were to ask me, I think Disney owe’s a huge debt of gratitude to Beauty and the Beast, Aladdin, and The Little Mermaid. And I know there’s a fan base to buy it. I totally agree, I don’t get the hate Disney is giving Aladdin. Now they have left millions of Americans to either import or pirate the movie. So frustrating. This is the second Disney movie for me in the past six months that I have had to import!